Parliament’s Police committee is continuing with deliberations on the renewal of the contract of the IPID head Robert McBride. 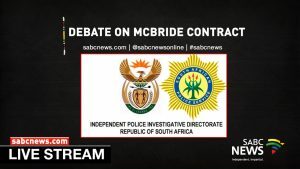 The committee is acting on an order of the high court in Pretoria over whether Police Minister Bheki Cele has the right to inform McBride that his contract will not be renewed. The post WATCH: Deliberations on the renewal of the contract of IPID head Robert McBride appeared first on SABC News – Breaking news, special reports, world, business, sport coverage of all South African current events. Africa's news leader..